South America Sheet I Ecuador, Granada, Venezuela, and parts of Brazil and Guayana. This is a beautiful example of the 1842 Society for the Diffusion of Useful Knowledge or S.D.U.K. map of the northern part of South America. It covers from Panama to Peru and depicts Ecuador, Granada, Venezuela along with parts of Brazil and British Guyana. Throughout, the map identifies various cities, towns, rivers, mountain passes and an assortment of additional topographical details. In the top left quadrant, the map features notes on the finished Canal of Raspadura and the proposed Canals of Cupica and Panama. In the interior of the province of Choco, the small ravine, de la Raspadura, unites the neighboring sources of the Rio San Juan and the small river Quito (a tributary of the Atrato). A monk of great activity, cure of the village of Novita, employed his parishioners to dig a small canal in the ravine de la Raspadura, by means of which, when the rains are abundant, canoes loaded with cacao pass from sea to sea. This interior communication has existed since 1788, unknown in Europe. The small canal unites, on the coasts of the two oceans, two points 75 leagues distant from one another. On the whole, it seems likely there was a canal, or had been. Possibly it was built by the Indians in an earlier epoch: they had been quite capable of it. Or possibly it was a Spanish smuggling route: not only cocoa but gold and silver might have been taken that way to avoid the duty – and perhaps the awkward questions – of officials at Panama. . . . The problem awaits an explorer. Envisioning an independent New World nation comprising all of the territories under the Spanish and Portuguese colonial rule, the Venezuelan revolutionary Francisco de Miranda suggested a consolidated South American empire named after Christopher Columbus. The idea took hold and in 1819 the territories known as the ‘Viceroyalty of New Granada' (comprising of modern day Colombia, Ecuador, Panama, and Venezuela), became the first South American region to liberate itself from Spain. The region was renamed ‘Gran Colombia.' The war against Spain ended in the mid-1820s when the pro-Spanish loyalists were decisively crushed. The congress of Cucuta adopted a constitution for the new republic in 1821. 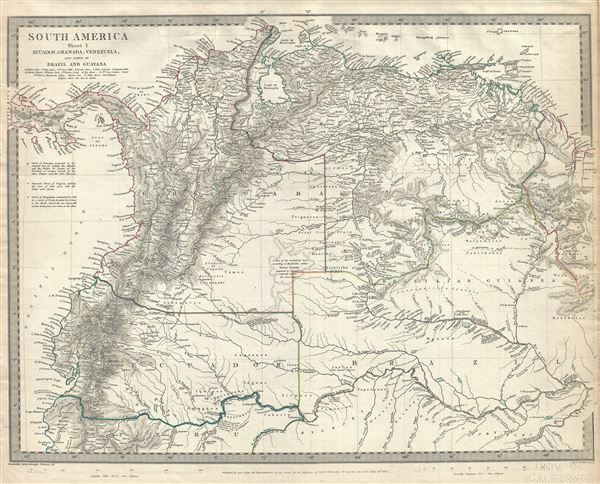 The vision of Gran Columbia, unfortunately, proved untenable and both Venezuela and Ecuador split off to become independent states 1829 and 1830, respectively. This map was originally copyrighted in 1842, but was issued in Volume two of Chapman and Hall's 1844 edition of Maps of the Society for the Diffusion of Useful Knowledge. It was engraved by John Walker of J. and C. Walker. Very good. Bears University of California Library Stamp, from which it was deaccessioned, in margin. Blank on verso. Narrow right margin. Rumsey 0890.147. Phillips (Atlases) 794.